Flexibility was one of the key elements always demanded by engineering and manufacturing applications. The diversity of requirements is high and therefore without enough flexibility you have hard time to accomplish a goal to tailor CAD, PDM or PLM system to the needs of a specific user. Flexibility usually comes a combination of two things – data and code. Flexible data allows you to define whatever elements of information you need to model. Think about custom metadata in CAD systems, data models to define objects and their relationships in PLM systems. These are core elements of flexible data. However, code is not less important. CAD and PLM systems have them all today – flexible attributes and custom information fields in CAD systems, PLM administration tools capable to define new data structure and inherit new ones from existing elements. Flexibility of CAD and PLM systems played a key role in commercial success of existing platforms. Think about flexibility of AutoCAD platform, which allowed to engineers to create many custom applications and scripts using AutoLISP language. I can bring other examples as well. Flexibility of application and customization options allowed to build an eco-system of developers. These developers served as a strong foundation of business success of platforms. Technology is not standing still. A broad introduction of web and cloud technologies is raising a question about what will become a foundation of future PLM platforms. CIMdata use term platformization to describe the trend towards future transformation of business application. My opinion is that existing CAD and PLM tools won’t become future platforms. Of course, this is only my opinion. But I’d like to focus on a specific aspects of future platforms – code and integration of application. Modern cloud software is not a monolithic application using relational databases or file system as a foundation. New cloud platforms are represented by a set of microservices running on elastic set of computing infrastructure. Read my earlier article – Will PLM microservices kill platform dinosaurs. My attention was raised by TechCrunch article speaks about Twilio. If you are not familiar with Twilio, I recommend you to take a look. Twilio is an interesting example of cloud infrastructure to orchestrate communication between various services (phone call, messages, etc.) Twilio is not the only example of such platform. You can think about others – Salesforce.com, Google Forms, Box.com and more. Navigate to the following link to read an article – Twilio’s IPO and the rise of the next 100M developers. My favorite passage speaks about how platform such Twilio is enabling apps without code. Cloud platforms like Amazon Web Services, Azure and others allow developers to get away from the business of day to day provisioning and management of servers. But cloud app platforms like Salesforce, Box, Twilio, etc. take it a step further, hiding even the code layer behind clean APIs. Using software like Workato, Boomi, or Snaplogic these APIs can be stitched together without code, creating a workflow that calls these apps to do things like creating leads, deleting files, initiating phone calls etc. It made me think about future trajectory of PLM platforms. Existing applications are using single database and scripting to customize application behaviors. It is absolutely flexible and powerful. However, at the age of cloud service can be limiting. 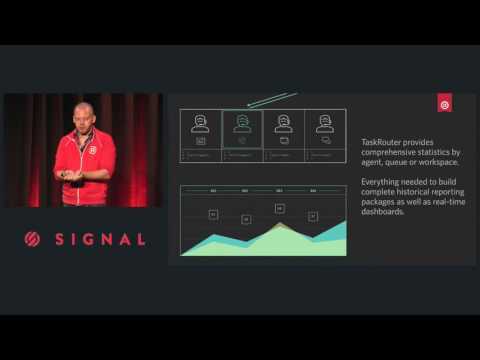 A good example of how to go beyond such limits is Twilio Taskrouter – a flexible workflow service that allows to stitch flow and logic between different services. What is especially interesting is the ability of Taskrouter to interplay between programmable services and human operators. The following video below can give you an idea. It is a bit long (~30 min), but I found it very interesting.